The Premise from the Publisher: "Kenzie holds one truth above all: the company is everything. As a citizen of Omnistellar Concepts, the most powerful corporation in the solar system, Kenzie has trained her entire life for one goal: to become an elite guard on Sanctuary, Omnistellar’s space prison for superpowered teens too dangerous for Earth. As a junior guard, she’s excited to prove herself to her company—and that means sacrificing anything that won’t propel her forward. But then a routine drill goes sideways and Kenzie is taken hostage by rioting prisoners. At first, she’s confident her commanding officer—who also happens to be her mother—will stop at nothing to secure her freedom. Yet it soon becomes clear that her mother is more concerned with sticking to Omnistellar protocol than she is with getting Kenzie out safely. As Kenzie forms her own plan to escape, she doesn’t realize there’s a more sinister threat looming, something ancient and evil that has clawed its way into Sanctuary from the vacuum of space. And Kenzie might have to team up with her captors to survive—all while beginning to suspect there’s a darker side to the Omnistellar she knows" (Simon Pulse). My overall thoughts and review: This book was pitched as The Darkest Minds meets Alien, and I'd like to push it one further and mention that it also has similar components to the CW's The 100 tv show. I don't often read a ton of sci-fi even though I enjoy the genre quite a lot. I find a lot of it can seem similar and repetitive, and it really needs to be written in a way that is accessible. I knew I instantly liked this book when the first chapter opened with the main character, Kenzie, reading manga before bed. 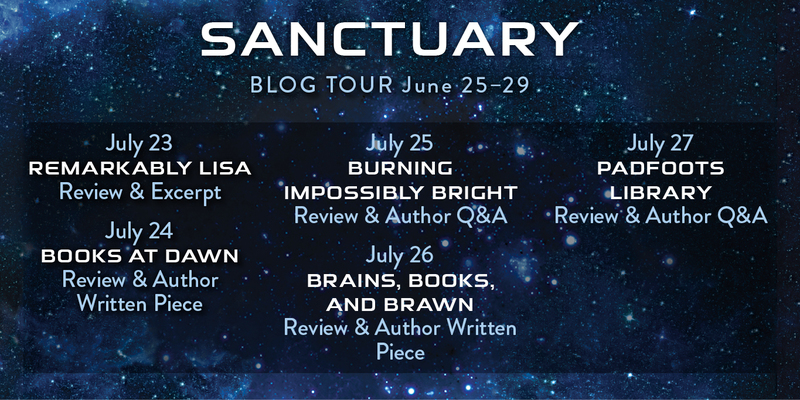 For Kenzie, her life has been consumed by Sanctuary, which is essentially a prison for superpowered teenagers. Her entire family works with her on Sanctuary and she is training to be a junior guard. The story opens with what seems to be drills that set up the story. However, the novel moves quite quickly that Kenzie is taken hostage by some prisoners that have planned a prison break. Through this tricky situation, Kenzie learns where her alliances lie, and what freedom actually looks like. Kenzie finds herself bonding with the prisoners and seeing that she connects with them on a much more deeper level. I had to remind myself a couple of times how quickly the novel moved because it was so action-packed. I liked that each chapter ended on a bit of a cliffhanger which had me turning the pages quite quickly. I also liked how the secondary characters were nicely developed, like Rune, Mia, Alexei, Tyler, and Anya. But the people that take center stage of the whole novel is definitely Kenzie and Cage. Both really strong characters that brought up a lot of questions about morality and freedom. I'm not usually a fan of insta-love, and it really isn't insta-love, but rather insta-attraction, but I immediately shipped them. I'm also all for a Mandarin Chinese love interest (kudos to Lix for all the diversity in characters). Overall, if you are looking for a fast-paced prison-break style sci-fi novel with a dash of aliens, this is the read for you. I look forward to seeing what Lix writes next for this group of teens and seeing where the story goes. Lix writes in a really digestible manner that even if you aren't a sci-fi reader regularly, you can definitely find something in this to enjoy! 1. Which character do you identify with most? I think I identify with all of them to one extent or another: Kenzie’s journey of exploration, Cage’s quiet exasperation that people don’t just do what he says, Mia’s frustrations, Rune’s desire for everything to work out well. Everyone in the book is a little bit of me! 2. What other other books, film, and/or television that take place in deep space inspire you? I am a huge Firefly fan, but there are a lot of deep space stories I love: the Expanse series, Guardians of the Galaxy, and of course Aliens. If it takes place in space, I’m pretty much there for it, all the way back to the original Star Trek series. 3. What do you hope your readers take away from the book? I hope readers have a great time with this story. I think it’s a fast-paced thrill ride, and that’s most of what I hope they get from it: the allure of adventure and the rush of near misses. On a slightly deeper level, there are a lot of messages in Sanctuary about questioning what you’ve grown up believing, being open to other perspectives, and looking beyond the surface. I hope that makes it through too! 4. 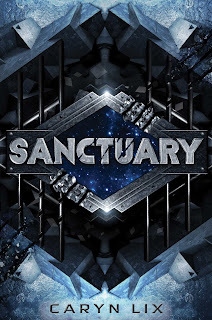 Is there more to come in the world of Omnistellar & Sanctuary? Absolutely! There is a sequel planned for next summer, and beyond that… who knows? 5. Also, because I'm a big manga fan and you basically had me from the first page where Kenzie is reading manga way past her bedtime, what are some of your favorite manga titles? I have an unhealthy obsession with Attack on Titan. I will take any opportunity to dress up as Hange and run around town in my ODM gear. I’m also a big fan of Sword Art Online. But the anime that really caught my attention WAAAAY back in the day was Ranma ½! Thank you so much, Caryn, for stopping by and answering some questions! 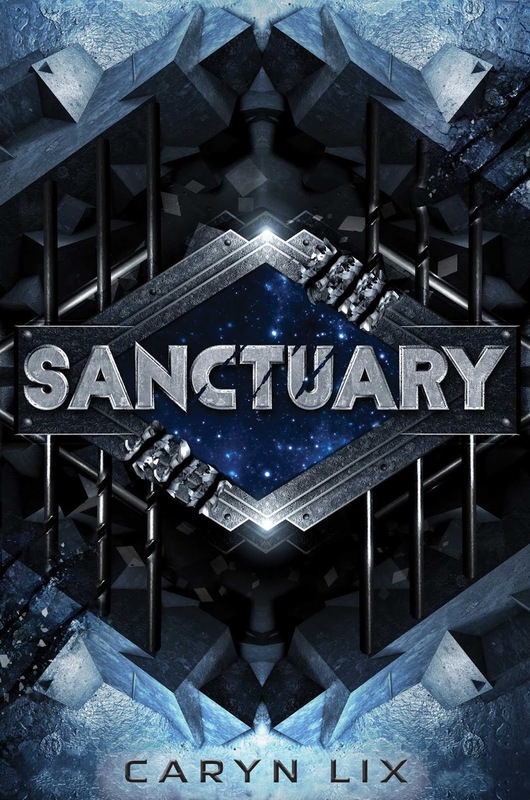 I look forward to the next installment of Sanctuary next summer! Disclaimer: An advanced e-reader's copy of the book was provided by Simon and Schuster Canada for participation in the book tour. All opinions of the book are my own. Great review. I love the reference to CW's The 100 as that is one of my favorite shows. it just makes me want to read this book even more.